The B+S Ovens are available in two ranges - VERRO and B+S Black. Ovens in both ranges are constructed from AISI 304 grade stainless steel increasing the longevity of the units. The VERRO ovens is fitted with a performance driven German made thermostat ensuring temperature accuracy at all times while cooking. 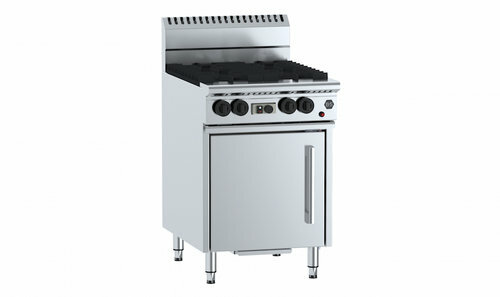 It is fitted with a solid drop down door with the internal gastronome capacity being the biggest in its class. The B+S Black Oven is fitted with a ‘U’ shape burner allowing the combination of natural convection to create an even distribution of heat throughout the chamber. Maintenance is made easy for both ranges with access to all components through the front of the units. The VERRO oven comes with a 24 month warranty and the B+S Black oven comes with an 18 month warranty. For more information or to view the brochure for this product, click on the image below. The VERRO premium fusion series ovens deliver the best in quality, performance and flexibility. All units are constructed from AISI 304 grade stainless steel and feature heavy duty European made vitreous enameled trivets with extended fingers that allow for smaller pots as well as large to be used in operation.